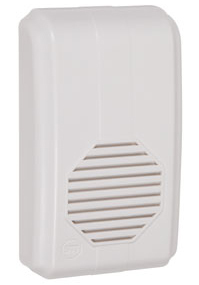 This extra receiver works in conjunction with other STI wireless doorbell chime products. The receiver plugs into an indoor standard electrical outlet and allows the chimes from any of the system transmitters to be heard. Multiple units can be placed in multiple rooms up to 150' from transmitter. This extra receiver works in conjunction with other STI wireless doorbell chime products. The receiver plugs into an indoor standard electrical outlet and allows the chimes from any of the system transmitters to be heard. Multiple units can be placed in multiple rooms up to 500' from transmitter. Receiver can play up to 10 sounds depending on which transmitter is used. For more information please see one of the following kits which includes this Wireless Chime Receiver: STI-3350, STI-3360 and STI-3610. Needed a new Door Chime, works great.